It is with deep sadness we announce the passing of James Thomas on April 7, 2019 at the age of 70, following a long ordeal with lung cancer. In the end, we take comfort that he passed away in his home surrounded by his loved ones. A devoted husband of Annie for over 42 years, dedicated father to Jerry, Roy and Ryan, loving father-in-law to Geeta, Nicole and Trisha and adoring grandfather to James, Alaina and Arya. Son of Chacko and Annamma Thomas (Thottakara), James was born in Ampara, Kerala, India on October 15, 1948. Following his older brother Jose, he immigrated to Canada in 1974 to start his new life in Toronto, Ontario. While working he completed his training in accounting, and met his future wife Annie Thakolkaran. They were married in Stratford, Ontario on July 9, 1977 and celebrated with their siblings Varghese and Susy Thakolkaran and Jose and Leela Thomas. 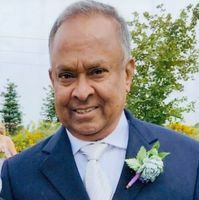 Following the birth of their three sons they settled in Woodbridge, Ontario, where James started his business, A & J Accounting Services, which he operated diligently for over 30 years, building strong relationships with his clients, many of whom that will remember him as a great friend. James’ nature was one to always help where he could, whether it was with the Catholic church, his family, friends, or the community. James was a modest man, but throughout his life, he was always most proud of his family. In the end, he leaves behind a legacy of a close-knit family that lives with the strong values he instilled in all of us and which we will always remember. He is also loved by his siblings (and their spouses): Baby (Chinnamma), Jose (Leela), Pappachan (Kuttiyamma), Sr. Jessy, Joy (Elsamma), Elsamma (Jose), Gracy (Iyppachan), Theyamma (Tomy) Sebastian (Molly), Francis (Lilly), Philomena (Jose), Sophy (Robert), and Jessy (Sebastian), as well as Annie’s siblings: Varghese (Susy), Simbru (Abraham), Joseph (Marykutty), Ittimathew (Kanoza), Thomas (Feena), and Mercy (Eugene). In lieu of flowers, the family appreciates donations be made to the Canadian Cancer Society. Thank you. Consider providing a gift of comfort for the family of James Thomas by sending flowers. Our deepest condolences during this difficult time. Our thoughts and prayers are with all of you.